Polish poet and grammarian, born at Przedborz about 1760; died at Tarnopol, Galicia, 1817. He followed in turn the professions of preacher, proof-reader, cantor, and teacher (1780). Feder was an ardent admirer of Elijah Wilna, and, like him, a bitter opponent of Ḥasidism and mysticism. As a grammarian he was looked upon by J. S. Biek as the successor of Ben Ze'eb ("Kerem Ḥemed," i. 96). As a writer of polemics his satire was keen and biting; his humor was original; and his imitation of the language of the Zohar was excellent. 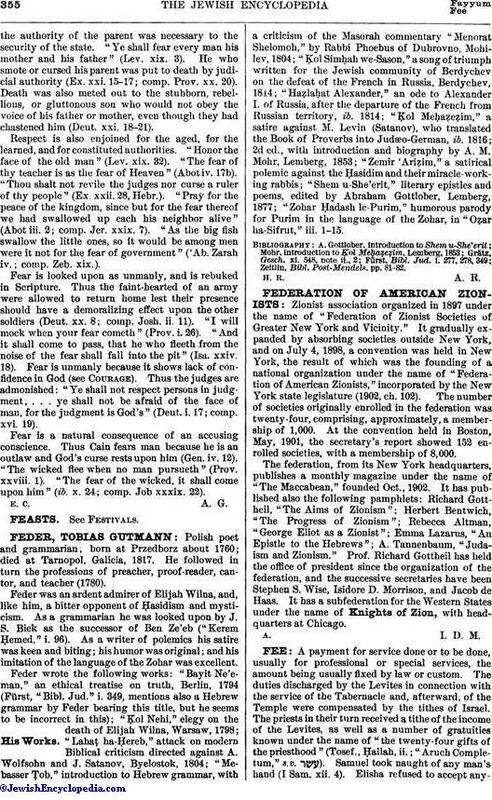 Feder wrote the following works: "Bayit Ne'eman," an ethical treatise on truth, Berlin, 1794 (Fürst, "Bibl. Jud." i. 349, mentions also a Hebrew grammar by Feder bearing this title, but he seems to be incorrect in this); "Ḳol Nehi," elegy on the death of Elijah Wilna, Warsaw, 1798; "Lahaṭ ha-Ḥereb," attack on modern Biblical criticism directed against A. Wolfsohn and J. Satanov, Byelostok, 1804; "Mebasser Ṭob," introduction to Hebrew grammar, with a criticism of the Masorah commentary "Menorat Shelomoh," by Rabbi Phoebus of Dubrovno, Mohilev, 1804; "Ḳol Simḥah we-Sason," a song of triumph written for the Jewish community of Berdychev on the defeat of the French in Russia, Berdychev, 1814; "Haẓlaḥat Alexander," an ode to Alexander I. of Russia, after the departure of the French from Russian territory, ib. 1814; "Ḳol Meḥaẓeẓim," a satire against M. Levin (Satanov), who translated the Book of Proverbs into Judæo-German, ib. 1816; 2d ed., with introduction and biography by A. M. Mohr, Lemberg, 1853; "Zemir 'Ariẓim," a satirical polemic against the Ḥasidim and their miracle-working rabbis; "Shem u-She'erit," literary epistles and poems, edited by Abraham Gottlober, Lemberg, 1877; "Zohar Ḥadash le-Purim," humorous parody for Purim in the language of the Zohar, in "Oẓar ha-Sifrut," iii. 1-15. Zeitlin, Bibl. Post-Mendels. pp. 81-82.